We left Mount Skene and travelled to Lake Eildon and decided to take the Jamieson to Alexandra road and arrived at the Lookout Point in Lake Eildon National Park. On my Rooftop’s Map it is named Williams Lookout. 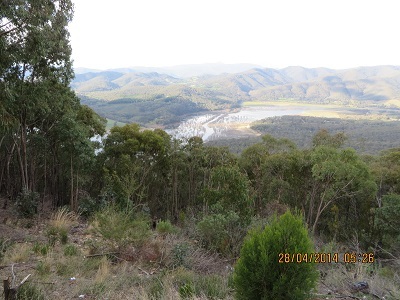 At this point, about six kilometres past the turnoff, there is a great view of the upper reaches of Lake Eildon. It is spectacular. I set up and checked the frequency at 7.090 and then gave a call at 05:19. Twelve contacts later at 05:57 it was time to pack up and head for Seymour. I spoke with VK5LY, Larry; VK3FQSO, Amanda; VK3FLAK, Bob; VK2AMA, Ross; VK2KVH, Victor; VK3NBC, Rob; VK5HS, Ivan; VK2CCW, Michael; VK5MBD, Bill; VK5FGRY, Gary in Morialta Conservation Park, VK7ZGK, Graham from Hobart and finally at 05:57, VK7KEV, Kev from Wynyard. I decided to pack up as we had to drive to Seymour. I was sorry we didn’t have more time to explore Lake Eildon National Park. It would be a great place to camp for a week and explore.